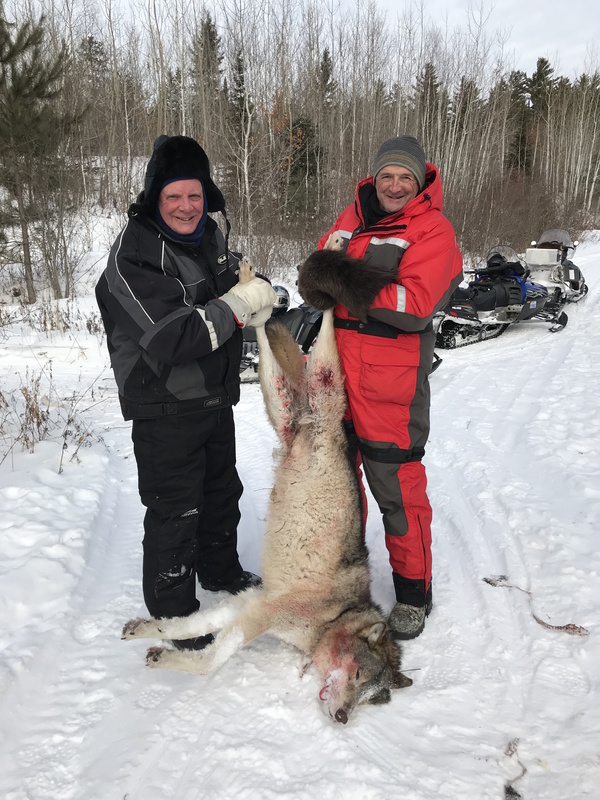 Thursday January 17, 2019 | Hyatt's Manion Lake Camp Ltd.
Don had some helpers yesterday as he checked his snares, he harvested this wolf. It has warmed up overnight, minus 19C, cloudy with a few flurries. Today's forecast -	Cloudy with 30 percent chance of flurries this morning and early this afternoon. Clearing late this afternoon. Wind up to 15 km/h. High minus 15. Wind chill minus 22 in the morning and minus 27 in the afternoon. Risk of frostbite. UV index 1 or low. Tonight	Clear. Wind up to 15 km/h. Low minus 32. Wind chill minus 27 in the evening and minus 42 overnight. Risk of frostbite.